I enjoyed the monochrome maxi skirt outfits I wore a short time ago so much that I wore the skirts similarly again! I liked these outfits just as much as the original ones. While it's summer here in Australia, I wore these in Spring in November. 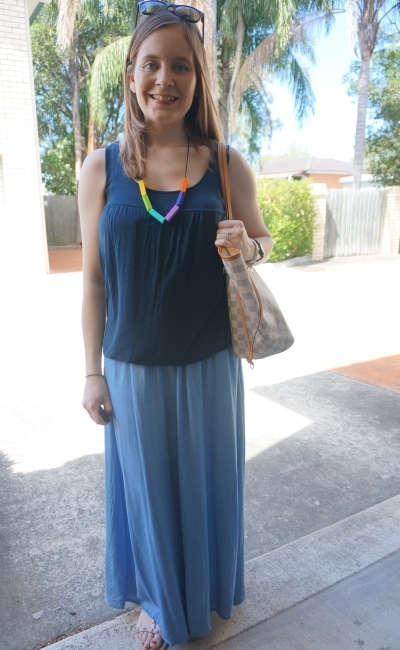 A simple maxi skirt and tee outfit was all that was needed for a quiet day. A little bit of shopping in the morning and a doctor's appointment in the afternoon. Although I've had both this tee and skirt for about 2 years I was surprised to look through the blog and see this is the first time I've worn them together! 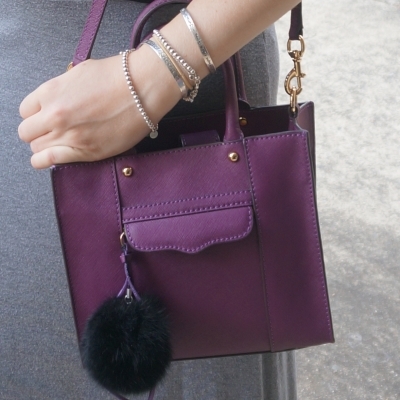 It was a nice easy outfit with a little bit of colour with the necklace and purple mini MAB tote bag. Last worn: Ray-Ban Wayfarers, black tee, grey jersey maxi skirt, studded gladiator sandals, Rebecca Minkoff mini MAB tote bag. Other ways to wear: black tee and leopard print, grey jersey maxi skirt and teal henley, studded gladiator sandals and shorts, Rebecca Minkoff mini MAB tote bag and leopard print scarf. This more colourful outfit was worn for a busier day. We had playgroup in the morning and then another specialist appointment for baby boy in the city in the afternoon. Thankfully my mum helped me with that last part, as although he'd run around at playgroup all morning it's still a big ask to have a toddler sit quietly in a doctor's office. Blue being my favourite colour, of course I really liked the colour of this outfit. Not too sure about the length of the top with the skirt though. The front panel style means I can't really tuck it in a little (like I'd usually do with a long top) and still breastfeed in it. I did think the proportions were a little off, so I probably wouldn't wear these two pieces together again. Last worn: Ray-Ban Wayfarer (above), navy breastfeeding tank, chambray maxi skirt, Rebecca Minkoff studded sandals (above), Louis Vuitton Neverfull bag. Other ways to wear: navy breastfeeding tank and blush blazer, chambray maxi skirt worn two ways, Rebecca Minkoff studded sandals and stripes, Louis Vuitton Neverfull bag and gold jeans. Linking up with Passion for Fashion, Fab Favourites, Grace and Lace, On Trend, Confident Twosday, Style Sessions, Wardrobe Wednesday. Awesome look! Love this Maxi skirt on you! Oh no, I hope you son is feeling better soon and home by Christmas. Love these looks and so jealous it is warm there! Monochrome is so pretty. I've always been a fan of black & gray. It's always beautiful. Also love various shades of blue together. Very nice pairing Mica. I didn't know about your baby boy being the hospital and I am so sorry to hear this :-( I am sending nothing but positive thoughts in your direction! Oh dear, I didn't know anout your little boy, I'm sorry to hear that. I wish him a fast recovery and that you all can be at home for Christmas. This maxi skirt outfits are so easy-breezy, perfect for summer! Love the different shades of blue in the second outfit. That light blue skirt looks so ethereal and dreamy, I truly loved it. So sorry your baby boy is in the hospital! Hope everything checks out okay soon. Oh no about your little one. Thinking of you all and hoping things improve quickly. Awh, I hope your little boy gets well and can come home soon - sending good wishes! Love the way you've styled both outfits, I think the grey skirt looks perfect with the top and purple bag - so cute! Thanks Jess! I do love a good drapey top! what fun necklaces! cute outfits! I hope your little one is feeling better and you can all be home for Christmas! I have said it before but I love your cute teething necklaces so much. Such great statement pieces! I finally followed you on Instagram and I hope all is well with your little one? Judging from your IG pictures, seems like you've been spending a few days at the hospital. Sending you and family positive vibes. I do follow on Instagram, but I must have missed your update. I'm going to head over there now and check it out. I really hope everything's OK! I will be thinking of you. I love both of these maxi skirt outfits. I'm so sorry to hear about your baby boy. I hope he has a speedy recovery in time for Christmas. Love the color blocking in this post, especially the blue outfit. Nice selection of maxi dresses! Long skirts are so lovely -- and practical! hope your boy is ok and you all will be back very soon! I sure do hope baby boy makes it home in time for Christmas. Sending up prayers. I love your skirts and your purple bag. I am so sorry about your baby boy! I am wishing him to get well soon and sending you loads of courage and energy. I will keep you in my prayers. Again, I hope things are okay with your little one. Good to hear it's just a precaution though. Aww, wishing your little boy well. Btw, I love how you incorporated some girly colors such as your purple bag and cute necklace to your minimal outfit ♥ Hope to hear from you soon! Loving it! ANd of course the bags are calling my name!! Loving that cute purple bag, lady! I am catching up on old posts but I certainly hope that he is out of the hospital soon. Big HUG Mica. I'm glad that you and baby boy are now home (I saw the update on your IG)! As for the outfits, I love them both, especially the first one, I love the pop of color the purple bag adds to the look! Thanks for sharing, beauty, and I hope you're having a great day so far! Love your cute maxi skirts! Still praying for you and your baby boy! I hope you can all celebrate Christmas at home! Also I am super impressed with 2 little ones you still have blog posts pre written! I am horrible and always writing mine the night before! 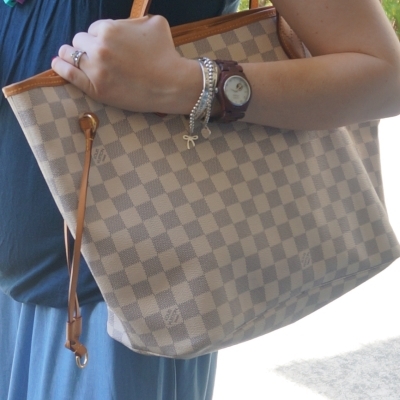 You look lovely in blue and I like how you set it off with the classic LV tote bag. You look great in maxi skirts so keep rocking them! I just love that first outfit, the monochrome, with pops of colour looks fantastic! Thank you all for your sweet comments on baby boy's hospital stay, your kind words were appreciated. He got to go home for Christmas so we are all very happy.